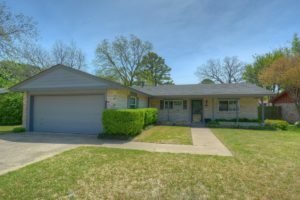 – This beautiful home in Woodland West Addition has lots of updates including roof 2018, windows, tankless water heater & custom blinds. Remodeled kitchen showcases large breakfast bar, granite counters, tumbled travertine backsplash, under-mount sink, all new cabinets & stainless appliances including microwave drawer. New carpet in bedrooms & gorgeous wood-look tile floors thru-out the rest of the house. Bathrooms both have tubs with new, beautiful subway tile surrounds, granite counters, undermount sink, new cabinets & raised shower heads. Home also features pretty 3-tone interior paint thru out plus new light fixtures & cabinet & door hardware. Large fenced backyard has nice-sized patio & wood storage bldg. If buyer has local house to sell first, owner will consider trade in. "Dwayne excels in his role with professionalism and knowledge that few possess. I highly recommend him to all my friends, family and clients to ensure 1st class delivery of sale."